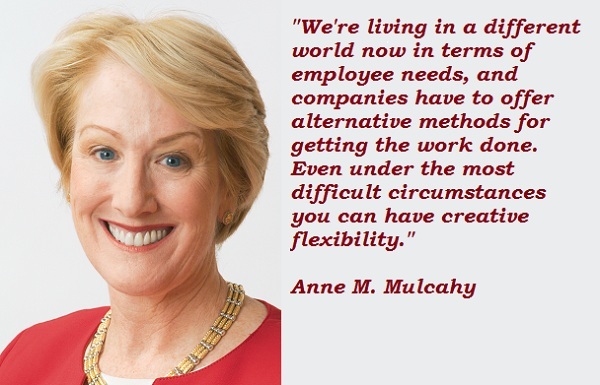 See the gallery for quotes by Anne M. Mulcahy. You can to use those 7 images of quotes as a desktop wallpapers. Work/life benefits allow companies meaningful ways for responding to their employees' needs; they can be a powerful tool for transforming a workforce and driving a business' success. Employees who believe that management is concerned about them as a whole person - not just an employee - are more productive, more satisfied, more fulfilled. Satisfied employees mean satisfied customers, which leads to profitability. Employees are a company's greatest asset - they're your competitive advantage. You want to attract and retain the best; provide them with encouragement, stimulus, and make them feel that they are an integral part of the company's mission. When you have that window of opportunity called a crisis, move as quickly as you can, get as much done as you can. There's a momentum for change that's very compelling. We're living in a different world now in terms of employee needs, and companies have to offer alternative methods for getting the work done. Even under the most difficult circumstances you can have creative flexibility. My dad was an editor and a writer, and that's actually what I aspired to be. As much as it's sometimes hard to make choices about where you invest, it's equally hard to make choices about where you don't invest and what you eliminate. Boards without women - blacklist those suckers. It's 2011. They've had the time - it's significant that they don't have women. Entire families work for Xerox. 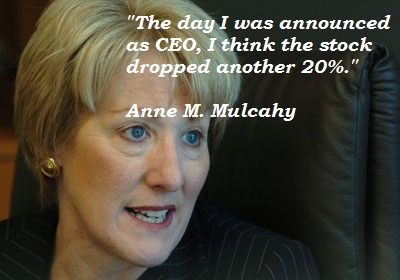 The day I was announced as CEO, I think the stock dropped another 20%. Turnaround or growth, it's getting your people focused on the goal that is still the job of leadership. You have to live the mission... love what you do. You know a good board when you see one. You should be accumulating really great relationships throughout your career. By the time I stepped down as Xerox's CEO in 2009 - and as chairman in January 2010 - Xerox had become the vibrant, profitable and revitalized company that it still is today. What made the difference was a strong turnaround plan, dedicated people and a firm commitment from company leaders. I got a journalism degree. I started doing journalism - I interned at 'Cosmopolitan' magazine in the 1970s, which probably wasn't the best place for me, and I spent six or nine months freelancing. Anyway, I wasn't that good at it. I have zero tolerance for people who don't come completely prepared. I expect contribution, I expect attendance, and I expect directors to take trips and visit the company's programs. I learned how to be a learner. When you get in a job, the tendency is to say, 'I've got to know it. I've got to give direction to others. I'm in this job because I'm better and smarter.' I always took a different view, that the key was to identify the people who really knew and learn from them. I worked in sales. It was definable, it had a quantifiable approach to accomplishment that had a great deal of importance to me. It had a degree of clarity that I loved. And of course, it was core. If we could muster the same determination and sense of responsibility that saves a country like Japan - or a company like Xerox - then investing to save women and children who are dying in the developing world would be very good business. If you're a global company you are going to have jobs overseas. The reality is if we start taxing those jobs at a rate that makes them noncompetitive in those markets, the reality is that we're going to lose business. Not everybody is created equal, and it's important for companies to identify those high potentials and treat them differently, accelerate their development and pay them more. That process is so incredibly important to developing first-class leadership in a company. 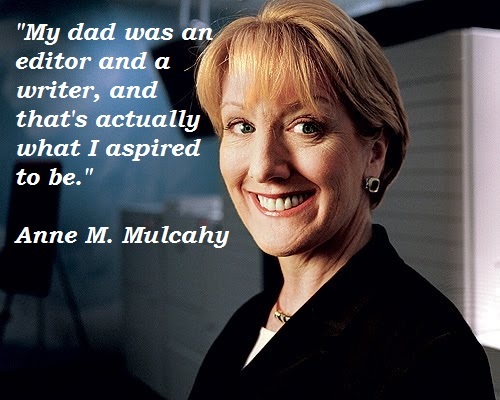 Much more quotes by Anne M. Mulcahy below the page. We're long past having to defend or explain why women should be on boards, given all the data that shows how companies with female as well as male directors perform better. 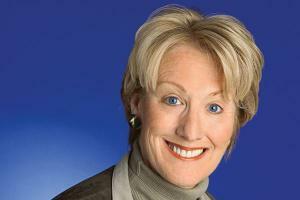 It's unfortunate when companies with a large percentage of women constituents don't reflect that in their boardrooms. When I became CEO of Xerox 10 years ago, the company's situation was dire. Debt was mounting, the stock sinking and bankers were calling. People urged me to declare bankruptcy, but I felt personally responsible for tens of thousands of employees. Whenever an earthquake or tsunami takes thousands of innocent lives, a shocked world talks of little else. I'll never forget the wrenching days I spent in Haiti last year for Save the Children just weeks after the earthquake.